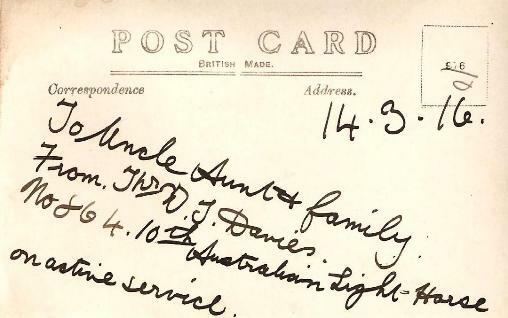 This card was sent to Thomas and Jemimah Jones in Brynaman (also spelled Brynamman), a village straddling the border of Carmarthenshire and Glamorgan. Jemimah was a sister of William Thomas Davies' father. According to Australian World War 1 personnel records, William Thomas Davies was the son of John Davies, a coal miner, from Neuadd Terrace, Brynaman, Glamorgan, Wales (see (see The family of David and Hannah Davies). 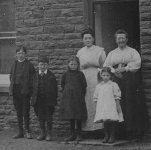 John was a widower in the 1901 census (where Willie T. is 6), but his wife Sarah and daughter Mary H. are recorded in Caegurwen (including Lower Brynaman)in the 1891 census. In 1911 father John Davies had been married to his second wife Hannah (45) for 9 years with no children of their own. Both John and William were colliery labourers. Mary H (Hannah) was living in the household of relatives John and Hannah Jane Harries as a servant. 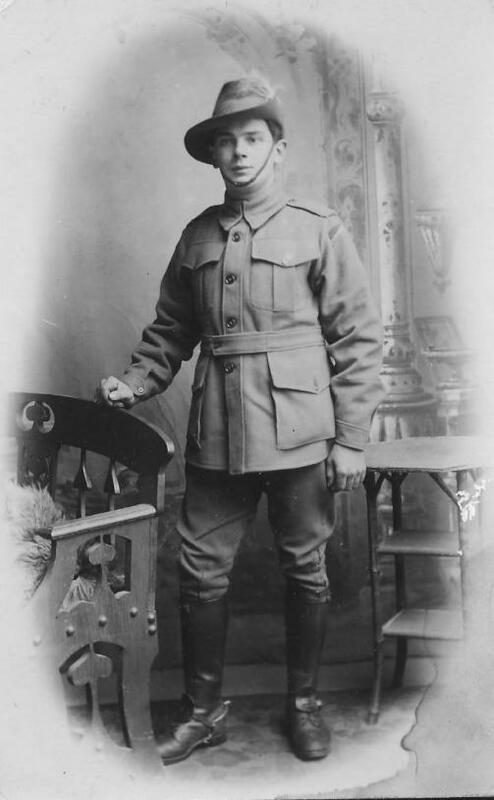 Having emigrated to Australia and become a bootmaker by profession, William Thomas Davies enlisted with the 10th Australian Light Horse at Perth, WA in January 1915, aged 20 years and 11 months. He was described as being 5ft 5ins, weighing 122 pounds, of dark complexion with brown eyes and black hair. He embarked on April 19 1915. He contracted dysentery at Gallipoli and was sent to the UK. In July 1916 he was detached for duty with the 16th Battalion of the Australian Imperial Force and sent to France. On 18 October 1917, the Amman Valley Chronicle reported that "Private Willie Tom Davies, A. S. C., had a warm welcome home at Ebenezer recently from the Front. A few months later he was given an enthusiastic send-off - intriguingly the newspaper article includes a head and shoulders crop of the photograph at the top of this page. In August 1918 he was returned to the UK suffering from appendicitis. He married Mabel Annie Helena Keeler (born March Q 1898), of 278 Fishpond Road, Bristol (daughter of Albert Ernest Keeler) on January 13 1919. William Thomas Davies returned to Fremantle, Western Australia, on the Koning Louise on August 3 1919 and was discharged on October 2 1919. His documents give an address at 38 Loftus Street, Perth WA. They appeared to have returned to the UK because, in the 1939 Register, they were at Brinkworthy Cottage, Bristol when Willy Tom was a plasterer. Two children were recorded although one entry remains officially closed. The other entry records daughter Joan Davies (born Pontardawe District 4 Nov 1923-1989) who married Robert S Cole in 1948. A William Thomas Davies (b. 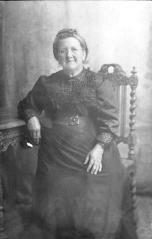 8 Feb 1895) died in Bristol June Q 1974 and a Mabel Annie H Davies (b. 17 Feb 1898) died in Bristol March Q 1982. 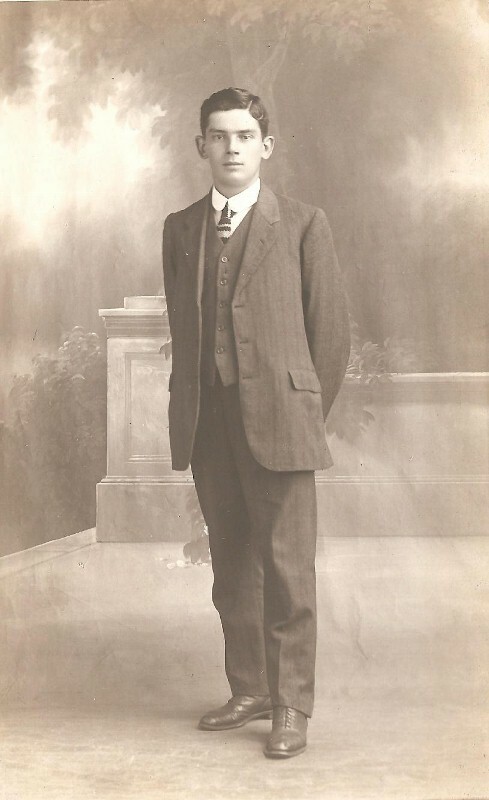 I Mr. Willie Tom Davies, y Terrace, Lower Brynaman, a Miss Mabel Keeler, Bryste. Bob amser yw ei waith. Cyn rhoi ei hun i lawr. Ym Mryste, pan y tariodd. Yn un dan goed y ddol. Grown by the Mynydd Du. "Come, let us join together,"
A garden and a home." "We'll be a queen and king." We wish you joy and honour. The Amman Valley Chronicle and East Carmarthen News, Thursday January 16, 1919.